“One thing led to another and pretty soon I was completely committed to stopping the urban renewal project and eventually to stopping the North-South freeway. Urban renewal was a federal program and it was basically a plan to get rid of minorities and get that (valuable) land they were occupying. These freeways that were inner city freeways were happening all over the country. “One of the great moments in Raleigh’s history was stopping the North-South freeway, different from Durham, which still suffers because of the resentment of the African America community. It’s an unbelievable story of two cities—so close. 147 was built here and the North South freeway in Raleigh was not. Randy Hester first moved to Raleigh to attend Design School at NCSU in 1963, and lived in Raleigh until 1980, working tirelessly as an activist and council member for the good of all communities in Raleigh. 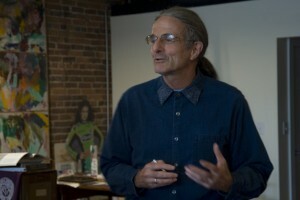 Randolph (Randy) Hester Jr. is a landscape architect, professor and sociologist formerly based in Berkeley, California. His practical work and teaching has focused on applying sociology to the design of neighborhoods, cities and landscapes. Hester is a strong advocate for community participation in the development of what he calls ecological democracies and sacred landscapes – spaces that grow out of a true understanding of the needs of a local community and the potential of its resources. His approach has excited communities across the US and abroad, and inspired countless students to actively engage the social and environmental context of their work..